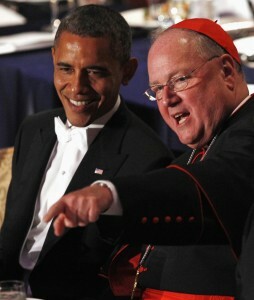 WASHINGTON (CNS) — New York Cardinal Timothy M. Dolan in a letter to President Barack Obama accepted a White House offer to continue discussing the Catholic Church’s concerns about abortion, traditional marriage and federal rules governing implementation of the Affordable Care Act. “We accept your invitation to address these areas together, always with the civility we have both encouraged in public discourse,” the president U.S. Conference of Catholic Bishops said in the letter Feb. 22. The cardinal also renewed good wishes and offered prayers for Obama as he prepared to tackle a long list of goals for his second term that were outlined in his inaugural and State of the Union addresses. Recalling a meeting with Obama at the White House, Cardinal Dolan pointed to the president’s stated desire “to cooperate with us for the good of our beloved country,” particularly in the church’s educational, charitable and health care services. “The bishops of the United States cannot rest so long as the vital ministry the Catholic Church carries out — for people of all or no creeds — remains threatened due to an erosion or loss of the constitutional guarantee of the freedom to serve without violation of our faith,” he said. * Reasonable regulation of firearms. * Increased attention to the needs of mentally ill people. * International assistance to the world’s poorest people. * Education reform, including parental choice. * Developing a financially responsible federal budget that protects the poor, sick and elderly. * Peace in the Middle East and an end to the war in Afghanistan. * Efforts to strengthen family life and uphold the importance of responsible fatherhood. “These issues of mutual importance are hardly new … . All of them flow from God’s own holy word in the Bible and the truth about the human person revealed in Jesus as faithfully passed on my the church,” Cardinal Dolan wrote. “They also resonate, as you have observed, from the most noble values of America, which the founders of our country identified in the Declaration of Independence as ‘self-evident truths,'” he added.